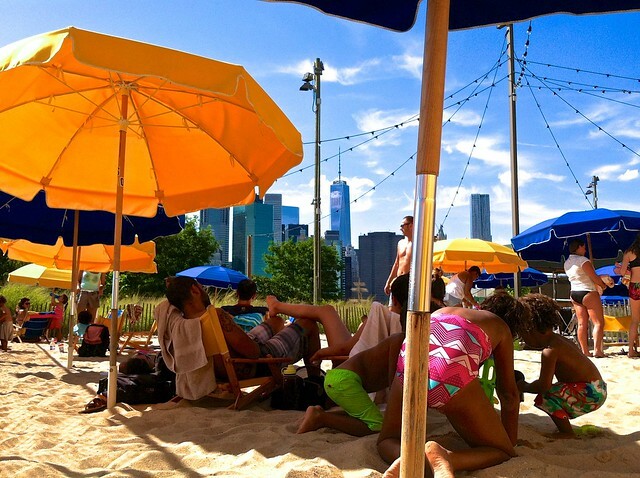 Wedged behind a construction fence, in a weedy corner of Brooklyn Bridge Park between Pier One and Pier Two, is one of the city’s secret delights: a pop-up pool and beach. If you aren’t familiar with the term “pop-up,” it is used to indicate that something (a shop, restaurant, etc.) is open for an intentionally temporary period. 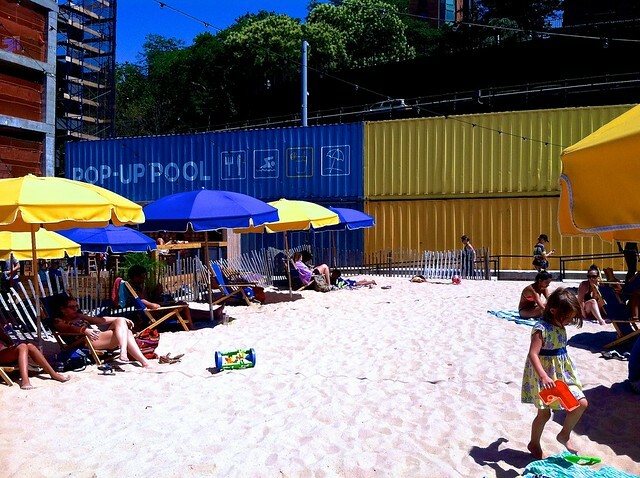 The pop-up pool and beach were built here with the understanding that they would be demolished after five years. 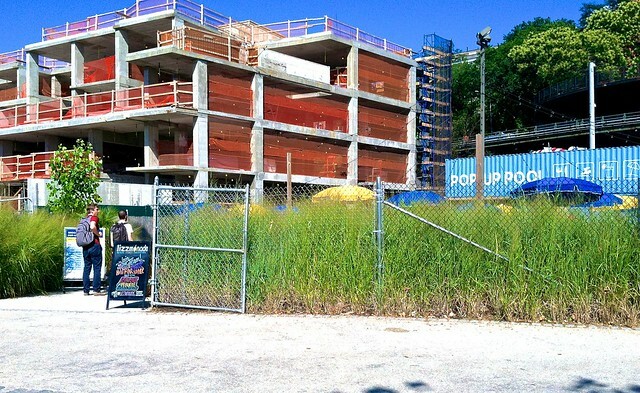 These summer attractions stand beside a luxury hotel and condominium project, known as Pierhouse, which is currently under construction. As Pierhouse nears completion, the land on which the pool and beach now stand will be integrated into the surrounding park. 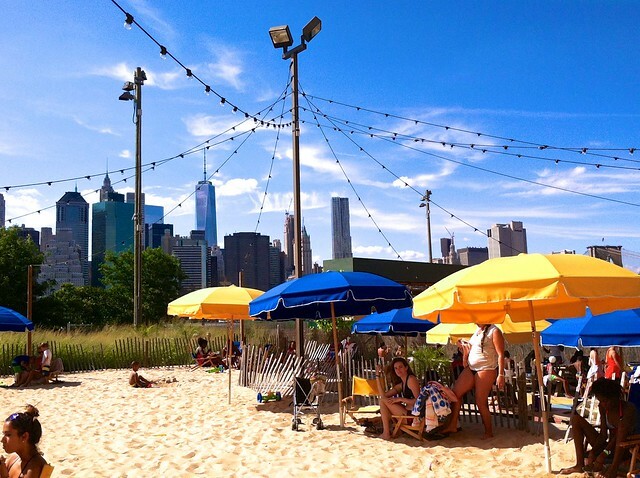 Until that happens, they offer a perfect respite from the heat and humidity of a New York summer. The primary feature of the tiny resort is a fenced-in blue pool that measures 30 by 50 feet and is only three to three and a half feet deep. 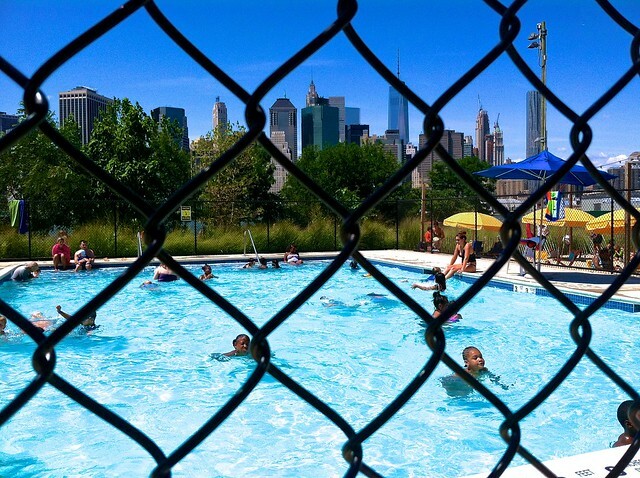 This is a wading pool, not a swimming pool, and it is the perfect depth for young children. No electronics, food, glass, or printed materials are allowed beyond the fence (hence, I could not take any photos from inside the pool). There are also changing rooms, communal showers and toilet areas. 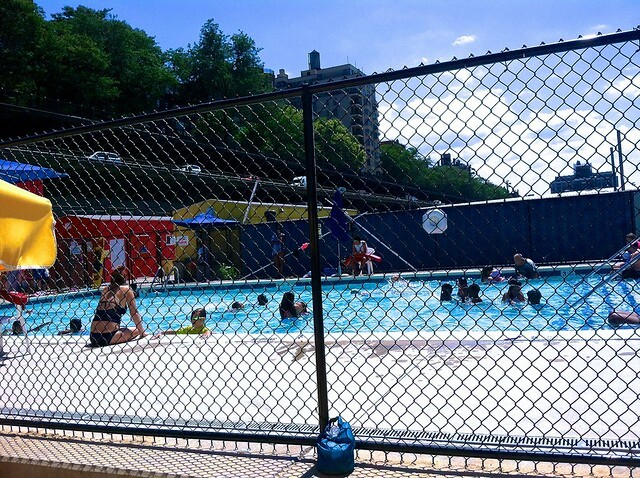 On the other side of pool’s fence is a sparklingly clean sandy beach complete with lounge chairs, shady umbrellas, an assortment of sand toys, balls and plastic spades and a snack bar that serves up lemonade, beer, chips and sandwiches. Aside from the food and drink, everything at the pool and beach are free. The rules here are strictly enforced and those who want to enter the pool area are inspected by lifeguards to ensure that they comply with the clothing and health requirements. If you want to go, the pool is open daily, 10:00 a.m. to 6:00 p.m, from June 26 until September 7. Wristbands are required for entry to the pool, and they are distributed hourly on a first-come, first-served basis. 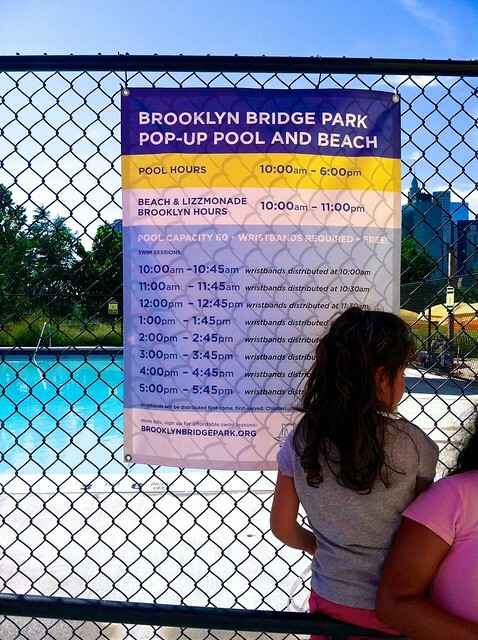 Since the pool’s capacity is only 60, it is wise to arrive early before the allotted number of wristbands are taken. Each wristband entitles the wearer to a 45-minute session in the pool. After each bathing period, the pool is closed and cleaned for the next wave of waders, splashers and sun-worshippers. 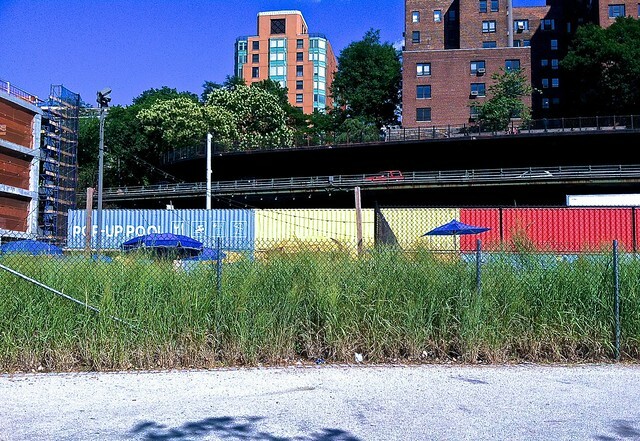 You are currently browsing the Blather From Brooklyn blog archives for July, 2015.